Tanker trucks are vehicles used to transport liquids, gases and bulk cargo. Getting such a truck for your business can be a great investment. You can ship fuel to gas stations or haul fluids like milk – there are many ways to make your investment bring you money. But a tank truck is a costly vehicle to buy and you can’t afford losing money on it if there is an accident. These trucks are heavy and large-sized vehicles. When there is a crash, the damage can be devastatingly great – for your budget as well. That is why you need to protect yourself with California Tanker Insurance. What California Tanker Insurance do you need? You should make sure you have proper California commercial truck insurance policy that will protect you in any situation. There are many coverages you can choose from to make your policy work for you and your business. Liability Insurance is required by law to operate any commercial truck. Should an accident happen, this coverage will pay for other people’s Bodily Injury and Property Damage when you are at fault. It is important not just because it is legally required, but because it saves you from huge losses if there is a collision. To protect your truck no matter who is at fault, you need Physical Damage Coverage in your Tanker Insurance policy. Collision coverage will cover you in case of collision with another object, and comprehensive insurance will pay for other situations when your truck is damaged. It can also be a good idea to get Cargo Insurance to insure your freights. The cost of this coverage depends of kinds of cargo you ship. 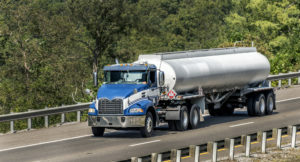 SafeLine Truck Insurance agents will help you decide what kind of California Tanker coverage you need. Call us today and get 25% off! We will be happy to assist you.